S&L Roofing is South Orange County's dependable and affordable residential cement shake roof inspection, maintenance, and repair company. With over 25 years of experience in the roofing industry, we have the knowledge and capability to expertly diagnose and resolve roof issues such as weather damage, roof leaks, roof deterioration, termite and dry rot damage, and roof drainage issues on all types of residential roofing systems. We perform all of our exceptional quality roof repairs keeping the long-term health and functionality of our valued clients' roofs in mind, and are committed to ensuring that their roofs last for as long as possible. Cement shake roofs are a relatively new type of roofing system which has become quite popular in recent years. 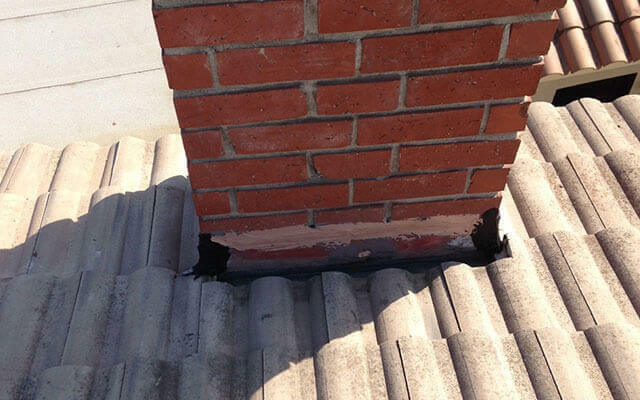 These roofing systems tend to be subject to paper underlayment failure, for a number of reasons. Cement shakes are designed with top and bottom edges which rest directly on top of the their asphalt-based paper underlayment. And during hot weather, the paper underlayment heats up and softens, developing tears as a consequence of the weight and pressure of the tile edges. In addition, in some cases, the cement shakes are attached to the roof by means of wood or plastic "batt" strips, which ideally, are constructed with regularly spaced drainage holes along the strip length. But often, inferior batt strips without drainage holes are used, which form little "dams" underneath the shake layer, preventing any water which penetrates beneath the shake layer from draining down the roof slope. 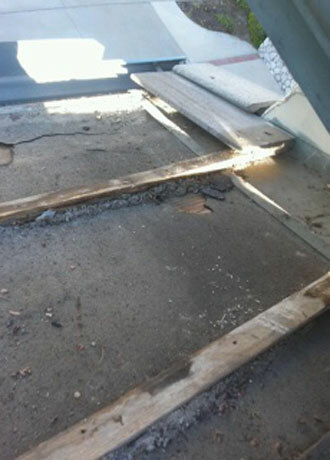 Needless to say, this combination of damaged paper underlayment and poor roof drainage becomes a major issue when water seeps under the cement shake layer through a broken tile, a poorly flashed roof transition, or a roof area which has been subject to wind damage, leading to the potential for significant roof leakage problems. Depend upon the roof maintenance and repair professionals at S&L Roofing to resolve any issues which develop with your home's cement tile roofing system. Call us today, for excellent workmanship at unbeatable prices. We provide our roof inspection, maintenance, and repair services to all of South Orange County, and provide free onsite repair estimates throughout our service area. Check for missing, cracked, or loose shakes; exposed shake underlayment - repair or replace as needed. Evaluate the condition of roof flashing - repair or replace as needed. S&L Roofing has repaired my roof on two occasions over the years. On both occasions the service was prompt, courteous, thorough and reasonable in price. I would not hesitate to use S&L again! . . .
Before: S&L Roofing was called for this roof repair in Laguna Hills, CA where there was a leak above one of the bedrooms. Upon inspection, we found that tiles had slipped down along the ridge and the hip line and water was able to leak through the roof due to broken up cement. This photo was taken after we removed 200 sq ft. of tile. The roof's felt paper was destroyed by the water. 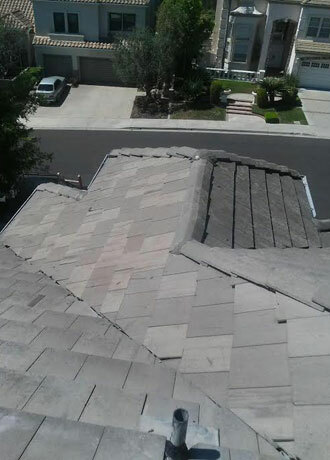 After: This roof repair in Laguna Hills, CA required us to pick up approximately 200 square feet of tile, re-felt the roof, and add mortar where it was needed. Our one-day roof repair fixed the leak we were called upon to fix and extended the life of the roof for many more years.